Bros Manifatture started out in the late 1970s as a maker of handcrafted watch straps. Since the 1980s, it has been a leader in high-quality products, all Made in Italy with rigorous standards and now carried by all the finest retailers. In 2002, the company launched the Brosway jewels line of steel fashion jewelry, with distinctive designs that were very favorably received. With the help of successful advertising campaigns and testimonials from celebrities such as Penelope Cruz, the production of jewelry eventually grew to become the company’s core business, to which a range of watches was added in 2006. “The focus at Bros has always been on the product,” explains Valerio Beleggia, Product Manager of Bros Manifatture, “and in particular on the three distinguishing attributes we call Quality, Innovation, Design." The market of fashion watches and jewelry calls for new models to be introduced each year, with a continual search for fresh and novel ideas. The company’s rapid pace of growth (from 18 to 24 million euros in 2007) prompted the creation of a Styling Centre having the organisation and capability to internally foster new talents. With dozens of new jewelry and watch models launched each year, it was essential that the software tools adopted should not only help speed time-to-market of products but also liberate and stimulate the creativity of the designers. “The requirements Bros had were essentially these: power and flexibility for designing any kind of shape, maximum accuracy, and ease of learning” says Luca Palmini, Product Design Manager. After assessing the different products on the market, Evolve was identified as the solution best able to answer all the company’s needs. “Our designers” Palmini goes on to say, “are constantly searching for innovative shapes, volumes and curves. Thanks to its exclusive construction history feature, Evolve allows unlimited alternative designs to be explored, stimulating the creativity of designers while at the same time assuring the accuracy required to move directly into production. Reduce the time-to-market of over 200 new products created each year while offering flexibility and accuracy to designers. Evolve allows for the exploration of design concepts that can move seamlessly into production. Design any type of shape, explore limitless styling alternatives and stimulating creativity of the entire team. 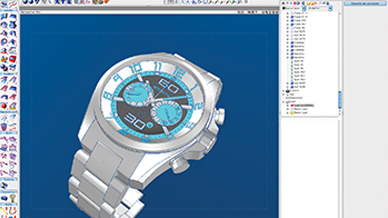 Send the developed designs directly into production, thanks to the high modeling accuracy. Vies and communicate designs both within the company and externally. “Once approved, the design can move straight into production. This is also a way to protect our creations, preventing any alteration by an outside contractor. 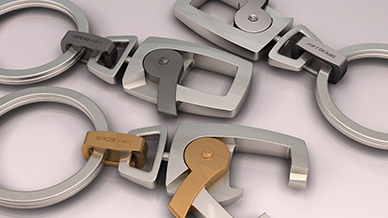 Bros Manifatture was established in 1979 as a small manufacturer of high quality watch straps. 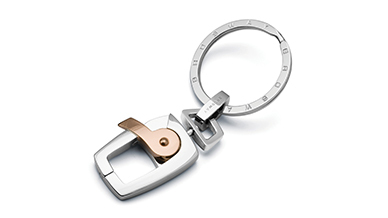 They quickly became a leader of the Italian fashion stainless steel design and custom jewelry markets.